Are you competitive? Do you want to challenge your friend to a race? Well now you can! 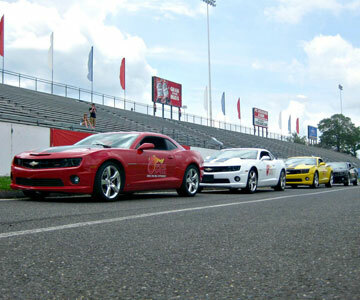 Drag race our Camaros against your buddy for bragging rights! Hop into this high horsepower muscle car and learn to stage a racecar. Once both drivers are properly staged, you’ll anxiously await the countdown to green, where you’ll accelerate off the line at full throttle, allowing you to cover the ¼ mile at speeds of over 100 mph in just seconds! Take the opportunity now to race against your friends. It’s your chance to take home the trophy in our side-by-side, single elimination bracket style race! Participants must be 18 years of age with valid drivers license.